﻿Published by Sareth Ney on Oct. 3, 2016 at 5:06 p.m. Updated on Oct. 4, 2016 at 10:26 p.m.
ORLANDO, Fla. – Spooky Empire Horror Film Festival have announced the schedule of the film festival screenings. They will take place from Oct. 7 through Oct. 9. Blair Bathory hosts. 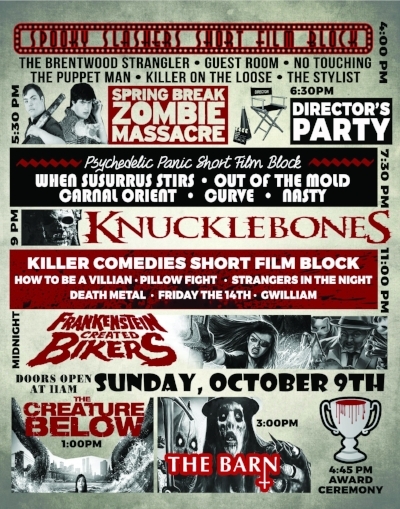 On Oct. 7, Spooky Empire Horror Film Festival opens their doors at 5 p.m. The opening ceremony takes place at 6 p.m. “Wolf’s Museum of Mystery” will begin the festivities. It features live performances a short film, question and answer (Q&A) session and special guests. 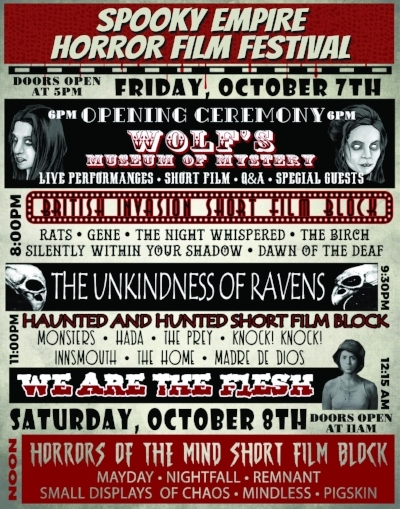 At 8 p.m., the British Invasion Short Film Block follows and the films screened are: “Rats”, “Gene”, “The Night Whispered”, “The Birch”, ‘Silently Within Your Shadow” and “Dawn of Deaf”. At 9:30 p.m., “The Unkindness of Ravens” follows up. One more short film block, “Haunted and Hunted Short Film Block”, begins at 11 p.m. Showings are: “Monsters”, “Hada”, “The Prey”, “Knock! Knock!”, “Innsmouth”, “The Home” and “Made De Dios”. Ending the first night of motion pictures is “We Are The Flesh” and it starts at 12:15 a.m. Starting at noon on Oct. 8, Spooky Empire Horror Film Festival’s doors are scheduled to open at 11 a.m. “Horrors of the Mind Short Film Block” kicks off at 12 p.m. “Mayday”, “Nightfall”, “Remnant”, “Small Displays of Chaos”, “Mindless” and “Pigskin” are going to be shown. Another short film block, “Spooky Slashers Short Film Block”, takes place at 4 p.m. It consists of: “The Brentwood Strangler”, “Guest Room”, “No Touching”, “The Puppet Man”, “Killer on the Loose” and “The Stylist”. “Spring Break Zombie Massacre” is scheduled for 5:30 p.m. and the director’s party will start at 6:30 p.m.
Also, on Oct. 8 at Spooky Empire Horror Film Festival—“Psychedelic Panic Short Film Block” is scheduled for 7:30 p.m. “When Susurrus Stirs”, “Out of the Mold”, ‘Carnal Orient”, “Curve” and “Nasty” are part of the block. “Knucklebones” follows at 9 p.m. Humor is represented at the horror film festival, during “Killer Comedies Short Film Block”. “How To Be A Villain”, “Pillow Fight”, “Strangers in the Night”, “Death Metal”, “Friday the 14th", and “Gwilliam” will be shown on the screen. A midnight showcase of “Frankenstein Created Bikers” will close out the festivities. Two full length features will be displayed at Spooky Empire Horror Film Festival, on Oct. 9. The doors will open at 11 a.m., “The Creature Below” will be shown at 1 p.m. and “The Barn” follows up at 3 p.m. At 4:45 p.m., the award ceremony will take place.